This fabulous, large condo (unit 3203) occupies the prime location at Kanaloa at Kona, an ancient, historic Royal Hawaiian site. You are truly smack dab ocean front with unobstructed views and sounds (not set back behind a swimming pool or hemned in between buildings). Its all here! 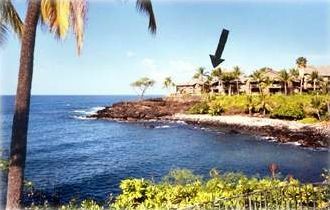 Situated at the entrance to Keauhou Bay, this condo is front row to the breakers and the open ocean, surfers, outriggers. boaters, snorklers, scuba divers, the mountain, the Kona Country Club (2 golf courses) and the Royal Hawaiian Slide. All rooms have water views. The living room and large private lanai have expansive, water front views of the ocean. The bedrooms face the water on the bay. At night, scuba divers visit giant mantas off the point fronting the condo. See the mountain and the Royal Hawaiian Slide which centuries ago served as a venue for competitive native sledding from the top of the mountain into He'eia Bay. The Royal path to the City of Refuge passes directly below the lanai. The Master BR has a California King size bed, a large walk-in closet, huge bathroom, make-up room and a small office for Wi-Fi (bring your laptop). A second bedroom has two extra long twin beds and a large walk-in closet. Adjacent is the second bath with a two vanity sink and shower/bath. The bedrooms & bathrooms are equipped with sheets, down-filled pillows, linens and towels (beach towels too). A large loft contains two regular size twins, closet and dresser. Approximately 1900 sq ft of living space, located on the second floor with vaulted, natural wood ceilings throughout. (Only top floor units at kanaloa have vaulted ceilings.) The home is newly painted, tastefully decorated and features rare giant bamboo furniture. The dining room furniture is native hardwood, wicker and glass. The kitchen is fully equipped with every appliance. On the lanai, there is a round glass table, 4 comfortable chairs, bar and fridge where you will do most of your dining, entertaining and relaxing. There is also a chaise lounge on the lanai for reading and snoozing. There are lighted tennis courts, three swimming pools (one for adults only) and barbecue grills on 16 beautifully landscaped acres. The resort is a gated community with full time security personnel at its entrance. Some of the best snorkeling in the area is in He'eia Bay right in front of the condo (watch your family snorkel from the lanai) where there are turtles and fish galore; and, when the surf is up you will have the finest waves for surfing. Within a short walk is the adjacent, active harbor at Keauhou Bay from which sport fishing, snorkeling and scuba diving excursion boats to the City of Refuge, Kealakekua Bay and Cook's Monument, come and go. These destinations remain sacred places to native Hawaiians and are harbors par excelence, teeming with healthy coral and fish. Kealakakua Bay is known for its spinner dolphins and humpback whales, a wonderful place to kayak. On Tuesday, Thursday and Saturday mornings, join the rowing club at Keauhou Bay for a workout on the ocean in an outrigger canoe. Departures at 6:30 AM & 8:00 AM. Last we heard, they added a 9:00 AM departure. This is a private club, very friendly and willing to offer you a paddle and a seat on board their double hull canoes. Kayak adventures also originate from Keauhou Bay. Or, you might decide to snorkel at Kahalu'u Beach (some say the best snorkel beach in the Hawaiian Islands) or surf or boogie board at White Sands Beach, both close by with lifeguards. We are golfers! Besides wanting to be on the ocean, that's the number one reason we purchased this condo! Kona is a golf Mecca with many other wonderful golf courses in the area. There are also trips to the Waimea Waipi'o Valley in the north for hiking and horseback riding; hiking and viewing the active KILAUEA VOLCANO in the south; and, star gazing on MAUNA KEA, one of the highest mountains in the world and home of the world's finest and most coveted telescopes. The condo contains a written list of recommendations for restaurants, beaches, activities and the like to enhance your visit. Your booking includes a local property manager on hand to provide on location service if there is any problem. Please note, air conditioning is an option at $31.24/ day. Husband and wife, retired parents and new grand parents, love the Big Island for its beautiful weather, golf, scuba, snorkel, paddling and hiking. Oh! We love their Bridge Center too. THE premier ocean front condo at Kona, nestled on a very private peninsula, front and center to 5,000 miles of open ocean as a backdrop to the hustle and bustle of Keahhou Bay and next door to the Kona Country Club. We can not think of a better place to be in all the world. Besides golf, we have a front seat for watching marine activity. We are also conveniently located near shops and restaurants, yet isolated, secure and quiet for relaxing in comfort. High Definition Television Programming (HDMI connection with DVR Recorder Feature), Roadrunner High Speed online wireless internet service throughout condo. We have stayed at Kanaloa 5 times and this Condo is our favorite one. One of the best views of the bay and ocean! Sunsets extraordinary! So much to do in Kona and on the Big Island. Aloha is shared with abundance. Great view, wonderful location, nice place to stay! The condo was clean and the view unbelievable. We saw dolphins playing the second we first went out into the balcony. Lots of space in this unit, and the price was extremely reasonable. We paid extra for the a/c, which was slow to cool the place down, but kept us comfortable by the time we were sleeping. The ocean pool was a perfect place to hang out when not at one of the local beaches. I would come back and stay here again. Nice condo unit. Clean and nicely decorated with a million dollar view. The king bed is very comfortable. The master suite includes a huge walk in closet, and great bathroom with huge shower. Not a negative but be aware that this is a 2nd/3rd floor condo so pretty good set of stairs to access. I would suggest paying for the a.c. if anyone is planning on sleeping in the loft. The complex is very nice. Some renovation work being done on the grounds but it didn't interfere with any of the facilities except the tennis court. I would return without hesitation and will probably do so. The unit was in a great location - relatively easy to get to through traffic from the airport - about a 20 minute drive with best traffic conditions. View was awesome - just stunning every morning to hear the waves crashing against the shore. Saw a couple of turtles in the bay adjacent to the unit. Unit itself was very clean and kept up - the mattresses seem to be relatively new and comfortable - and all furnishings were in excellent condition. Kitchen was well stocked with the necessities for maintaining a family. It was very refreshing to have a cold pitcher of water and newly made ice cubes upon our original arrival - very welcomed after a flight and drive from home. Grabbed a glass of ice water and moved immediately to the lanai to take it all in before moving on to unpack and get settled in. While we were there, the internet connection disconnected itself several times - but disconnecting the modem for 2-3 minutes and having the system reboot itself took care of that problem. Also, the morning of departure, the washing machined copped an attitude and decided it was done for the day. Had to return with a luggage full of wet/dirty laundry (we had been night snorkeling the night before and got in very late). Not a big deal. There's designated parking for the unit. Upon arrival, a car occupied the spot. We were later told that it was the owner's car. About 2 days later, the car disappeared and we were able to use the spot. Otherwise, parking wasn't an issue, even with the spot occupied. I do strongly suggest that any potential renters during the summer opt for the optional air conditioning fee for $25/day. The unit is on top and gets extremely hot during the day and takes some time to cool down - and this was during a relatively cool spring week. Sleeping the first night was difficult because of the heat of the unit. Also, the unit below is under re-modeling. Don't know how long this will continue, but if you are coming into the unit over the next 60-90 days, check with the management company about how far along the remodel is going to last. We were there between March 22 and March 28, 2013. We would return again in a heartbeat. There is plenty of common area parking available on site adjacent to the unit. The covered parking space is not offered as part of the use. We have not had window coverings in the living room for several years. It was a choice made to enhance the views without suffering any loss in privacy. The phone line has been fixed and the one blanket in the master bedroom has been replaced. It often gets warm very humid in Hawaii even when you are on the ocean. 2 years ago, we completely replaced the 5 ton central air condition system. It does a great job when the windows and doors are closed.